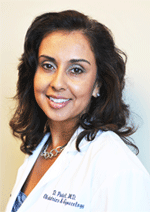 Dr. Daxa Patel is an Obstetrician-Gynecologist in Wellington, Florida. She is affiliated with multiple hospitals in the area, including Palms West Hospital and Wellington Regional Medical Center. She received her medical degree from University of Missouri-Columbia School of Medicine and has been in practice for 19 years. Dr. Patel accepts several types of health insurance, listed below. She is one of 42 doctors at Palms West Hospital and one of 58 at Wellington Regional Medical Center who specialize in Obstetrics & Gynecology.